Trivial Pursuit co-creator Chris Haney passed away yesterday. Aged 59, the American public broadcaster died in a Toronto hospital after a long illness. Haney and his fellow journalist Scott Abbott came up with the game in December 1979 after an argument over a Scrabble match. Three years later, the game was launched. And so, a tribute. 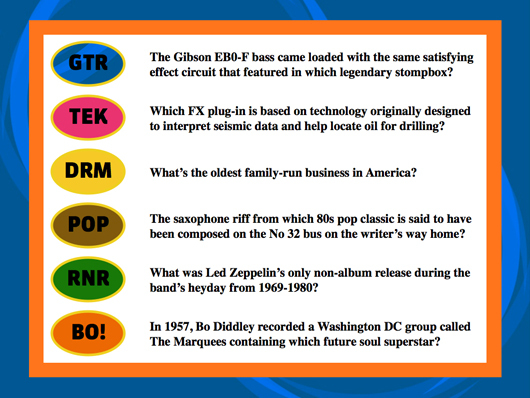 Every musician who has grown up with the multi-million selling Hasbro board game loves the chance to show off their music knowledge whenever a suitable question comes up in the pink Entertainment category. Thus in celebration of both Haney and trivia, we've come up with these six questions with MusicRadar categories. Guitars (GTR), Tech (TEK), Drums, (DRM), Pop (POP), Rock (RNR) and Bo Diddley (BO!) - a seemingly random choice but given it's the sadly deceased guitar legend's birthday today (he would've been 82 today), it seemed fitting. How many did you get right? Let us know below.